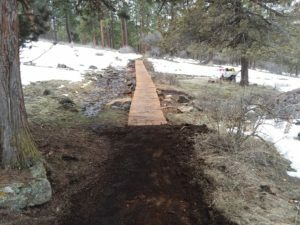 A new Bridge has been built! Even though the snow hasn’t melted, dedicated members built a new bridge crossing the swampy area on the east side of Hayride Tr. There was a small bridge there already, but that one was getting old and didn’t cross the whole problem area. Much of the materials were local and used the juniper logs left in the area from the brush clearing/fire suppression efforts a few years ago. Good Work!